Adrian Townshed thought she had everything: a job she liked as a TV production assistant and a handsome husband who was a rising star in his own field. In as enviable life they’d worked hard for–the American Dream. Until she got pregnant. Suddenly all she had was chaos. And Steven’s ultimatum. Him or the baby. The question was: did he mean it? He did. Bill Thigpen and Adrian Townshed collided in a supermarket. And the very sight of her suddenly makes him want more in his life…. a woman he really loves, a real family again. But does he need the heartache of another man’s baby, another wife? Neither does. But they couldn’t help it. 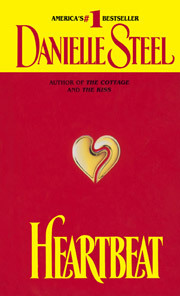 Danielle Steel touches the Heartbeat of two wonderful people as their friendship deepens into love, as they meet the obstacles that life presents with humor, humanity, and courage.